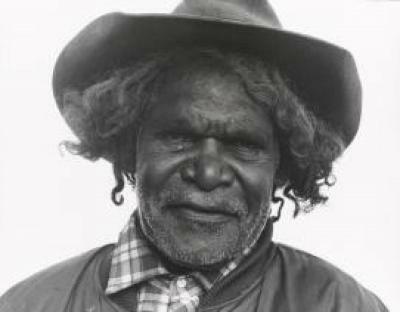 Freddy West Tjakamarra was born in the Pollock Hills, near Kiwirrkurra in the Wesern Desert of Australia. Early on, he lived a semi-nomadic lifestyle, traveling between different settlements in the desert. In his community he is considerd a brilliant tracker. In 1963 Freddy started to walk to Papunya with his familly. He began painting with Geoffrey Bardon and is one of the original Papunya shareholders. Freddy's precise concentric circles pulsate like Optical Art. He also is well known for his concentric squares. Vivien Johnson, Lives of the Papunya Tula Artists, Alice Springs NT 2008, p. 78-80.